As this incredibly long Indian Summer is coming to an end, we felt the need to escape one more time to an exotic place before giving in to winter. Sri Lanka is one of these destinations we’d wanted to explore for a long time now. This island-country located South of India is famous for its lush spice gardens, rice fields and tea plantations, endless beaches, cloudy mountains, timeless ruins and welcoming people. 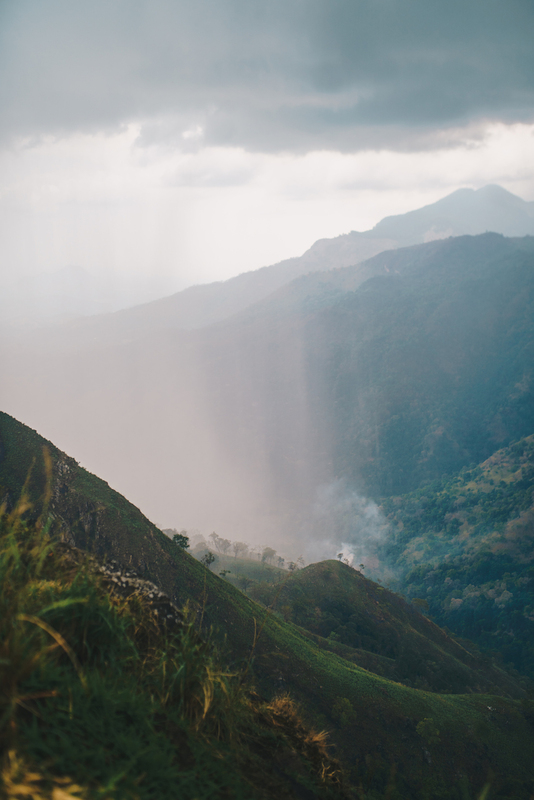 Belgian traveler duo Louis Vielle and Larissa Mathieu went on a journey from Kandy to Ella. Follow their adventure and discover their tips to make the most out of your next trip to this gorgeous island. “Travelling is the only thing you buy that makes you richer”. This quote perfectly reflects the experience we lived during our three weeks in Sri Lanka. If you ever travel to this country, there are a few sights worth seeing that you must put on your list of activities. One of them is Ella, a small and authentic town located in the Sri Lankan mountains. Ella is surrounded with hills and rainforests covered in mist and clouds. There are also many tea plantations around the town where most locals work. The “Ella Gap” allows you to gaze across the southern plains of Sri Lanka. The best way to reach this amazing place is by taking the train from the second biggest city of the country: Kandy. For a few rupees only, because train is the cheapest travel method in the country, you can embark on a colourful train for a journey through the mountains, rainforests, tea plantations and waterfalls, which make most of the fabulous Sri Lankan landscapes. There are three trains a day shuttling from Kandyto Ella, the first one departs at 08:47, the second at 11:10 and the last one at 17:00. The journey lasts 7 hours, which can be pretty long, so we would recommend taking the first or the second one to fully enjoy the view in the sunlight. Personally, we chose the 11am one to first enjoy a breakfast in Kandy. Kandy is the second biggest city of Sri Lanka and abounds with good addresses to eat. Many of them are more stylish and exotic than what you usually find in the country. Well hidden in the centre of the city, we found the Café Secret Alley. This small coffee shop is modern and European and attracts many backpackers like us. They offer a variety of brunches, including pancakes, smoothie bowl, avocado toasts, milkshakes and of course, coffees. If calories are no problem for you, try the brownieshake, which is pretty much a giant milkshake, topped with a brownie and some ice-cream; heavy, but nonetheless delicious. The train is a sight to behold. You can enjoy a mind-blowing scenery, travelling merchants, local families with their massive baggage. Taking the train in Sri Lanka is normally easy and does not require organisation. However, as this line is known as one of the most beautiful rides in the world, expect it to be quite packed. It is not necessary to book in advance, yet we would recommend being in the ticket line an hour or two before the train departure (especially in the high season). Make sure you buy a second- or third-class ticket to enjoy the ride with the locals. When the train arrives, you can choose between sitting for the whole trip, or standing next to the doors, where you will enjoy a better view. As I mentioned earlier, the train from Kandy to Ella is usually packed, sometimes to the point where you cannot move. To avoid this, take a shorter ride from Haputale or Nuwera Eliya, or enjoy the journey backwards, going from Ella to Kandy. The most iconic piece of architecture in Ella is definitely the “nine arches bridge” of Demodora. This 25-metre-high bridge was built by British colonials in 1921 and has become a must-see activity in the city. Hidden in the lush vegetation and accessible via a path through the jungle or a hike along the rails, the massive stone intruder stands impressively and is a favoured spot for tourists. It’s possible to avoid the tourist rush by reaching the bridge early in the morning, around 7am, where no one will bother you, and you’ll be able to enjoy a stunning light. Since Ella is located in the mountains, it’s surrounded by nature. There are many hikes and trails you can enjoy admiring the remarkable views such as the Ella Rock or Little Adam’s Peak. The latter is very easy, it consists of an hour and a half trip going through the tea plantations, where you will probably walk past tea pickers working in the fields. An hour away from the city, we discovered a place named Diyaluma falls. In Ella, rent a scooter or take a bus and head south. Find the Upper Diyaluma Falls hike to reach the top of the waterfalls. Asking a local to guide you may be a good idea because the hike is not easy to find. Once at the top, you will be able to swim in a series of natural pools and falls. It’s best to do it on a sunny day, so you can relax, swim, and even jump if you feel reckless. The last pool offers a unique view of the surroundings. The centre of the city is animated and welcoming for travellers. There, you’ll find nice spots to eat, like the Chill Café, 360 Ella or even Café C and Adam’s Breeze, which are probably more local places where you can enjoy typical dishes such as a flavoured “Rice and Curry” or a “Khotu”. At night, head to a local bar. They sell a variety of local coconut alcohols and exotic cocktails. To sum up, Sri Lanka in itself is really worth seeing. It offers a large variety of possibilities for everyone and that is probably what makes this destination so awesome. If you are not a mountain lover, you can still enjoy idyllic beaches, welcoming cities with an animated nightlife, sacred and historical sites, etc. Last but not least, we would advise aspiring backpackers to get off the beaten tracks and enjoy the wild side of Sri Lanka. Our best memories were definitely the unexpected ones. To the question “Would you go back tomorrow?”, we would say YES without a doubt. So let yourself be surprised by Sri Lanka like it surprised us.